Collectively, we were The Men Who Came to Dinner - and stayed for days. On Feb. 6, 1978, the 26th annual Beanpot Hockey Tournament was scheduled for the Boston Garden. Despite a huge storm forecast for the Boston area, fans streamed into the building for the games between Northeastern and Harvard and Boston College and Boston University. There were 11,666 people in attendance - far fewer than the usual sellout crowd, but still remarkable given the forecast. 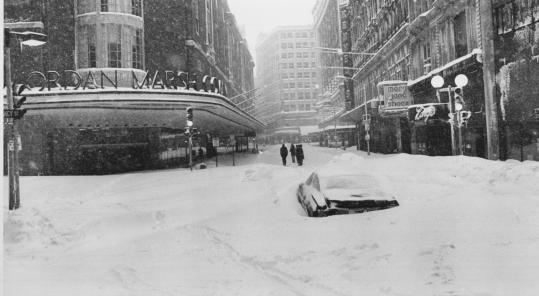 From the beginning, the fates seemed to conspire to ensure that hundreds of us would be calling the Garden home for the Blizzard of '78 and its aftermath. In the first game, Harvard beat Northeastern, 4-3, in overtime, which meant the second game didn't start until well past its scheduled 9 p.m.
Nate Greenberg of Newton, who recently retired after 34 years with the Boston Bruins, knew that two Bruins officials working the Beanpot - announcer Weldon Haire and timekeeper Tony Noto - lived a good distance from the Garden and would have trouble getting home. He took over both their duties at the end of the first game and sent them home. Near the end of the first period of the second game, Greenberg took a call from the MBTA, telling him that the T would be suspending operations from North Station in about 15 minutes. Greenberg made the announcement to the crowd: "Boston is under a state of emergency and anyone taking mass transit should make plans to leave early." Many left. But many stayed, too. After all, BU was in the middle of whipping BC, 12-5, and what real BU fan could leave? The late game meant I was required be at my post at Garden Concession Stand No. 5 in the West Lobby until well past 11 p.m., and wouldn't be able to check out until near midnight. By that time, my Volkswagen Super Beetle had long since disappeared under the drifting snow. Unlikely to get back to my apartment in the Neponset section of Dorchester, I called an old girlfriend on Hereford Street in the Back Bay to see if there was room on her couch, but by that time the MBTA had long since stopped running, there were no taxis, and I didn't feel like walking. About 200 storm refugees were being rounded up and brought to the Blades and Boards Club underneath the Garden. There were very few women - the vast majority having too much common sense to attend a hockey game during a blizzard, or not to leave when warned to do so. The temptation to stay put in the Garden was strong. There was free coffee, leftover hot dogs, and popcorn. We knew where there was beer to be had. Card games had broken out all around the club. Really, what else does man need? The Garden's skyboxes - spartan by today's standards - provided shelter for many of us for several nights, while others sought refuge in the Bruins' and Celtics' dressing rooms. "I had Skybox No. 1," recalled fellow concession employee Kevin Coyle, then of Watertown. "It was warm and I had color TV." In the morning, we were brought en masse to a coffee shop. We got a lucky break when the Stop & Shop bakery across the street couldn't ship its goods out to other markets and sent some of its muffins and doughnuts over to us. Most of us knew we weren't going anywhere for a while. Governor Michael Dukakis had declared a state of emergency, and no one except law enforcement personnel and heating oil truck drivers seemed to be on the road. Greenberg set up a caravan that ferried Bruins players to Manchester, N.H., so they could get out of town for their game in Detroit Thursday night. Greenberg recalled that his former Herald Traveler colleague, the late Cliff Sundberg, covered the Beanpot as a favor for Associated Press sports editor Dave O'Hara and ended up staying in the Garden for three days. "I think he was paid something like $7.50," said Greenberg. After 72 hours in the same clothes, those of us still in the building on Thursday morning were pretty ripe. I decided to make a break for it, even though driving was still banned. I had an old press card from the Cape Cod Times, which would give me passage. I was stopped by the State Police on the Southeast Expressway, but I fished out the card and was allowed to proceed. I ended up getting off the Expressway at Granite Avenue. I got as far as the Neponset River Bridge before the road gave out and I had to abandon the car. I then trudged to the Eire Pub at the corner of Adams Street and Gallivan Boulevard in Dorchester, where I sought liquid sustenance before heading toward my apartment. It was Friday morning before Coyle and the remaining stragglers finally called it a day. That's when Garden officials told them the party was, indeed, over. The MBTA was running at least partially again, and it was time to go home. Coyle took the train to Harvard Square and then embarked on a long walk to his Watertown home. Twenty-three days after the blizzard, the Beanpot championship game was finally played. BU beat Harvard 7-1. Rich Fahey can be reached at faheywrite@yahoo.com.